The Club have a range of different boats and equipment available to members to hire at a very reasonable rate, so if you are new to paddlesport don,t rush out and buy a boat until you have tried a few different types from the club, or even ask more experienced members, they will usually be more than happy let you have ago in their own boat to see how it feels. Believe me buying the right boat can be a mine field and often in the beginning a lot of money can be wasted on wrong or unsuitable equipment. What Types of Kayak or Canoe? Good for: whitewater; slalom racing; surfing; shore sea trips; general use for all kinds of paddling. 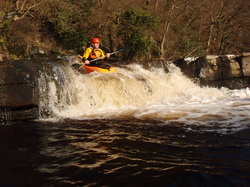 Good for: flat water touring; beginners; sheltered lake and coastal trips; wild water racing; marathon racing. Good for: family canoeing; canal and river touring; beginners with special needs; (disabled, blind, very young); carrying more than one person; wilderness canoeing; carrying camping equipment. All canoes and kayaks should contain built-in flotation material. This must be sufficient to float the fully swamped boat at the surface in a horizontal position. The flotation usually takes the form of solid, plastic foam - it must be held securely in place or it will be lost or displaced by the boat’s natural flexing. Kayaks should be fitted with an adjustable footrest system and a grab handle or toggle at both ends of the boat. Don,t worry, just take your time, and in the mean time borrow from the club.